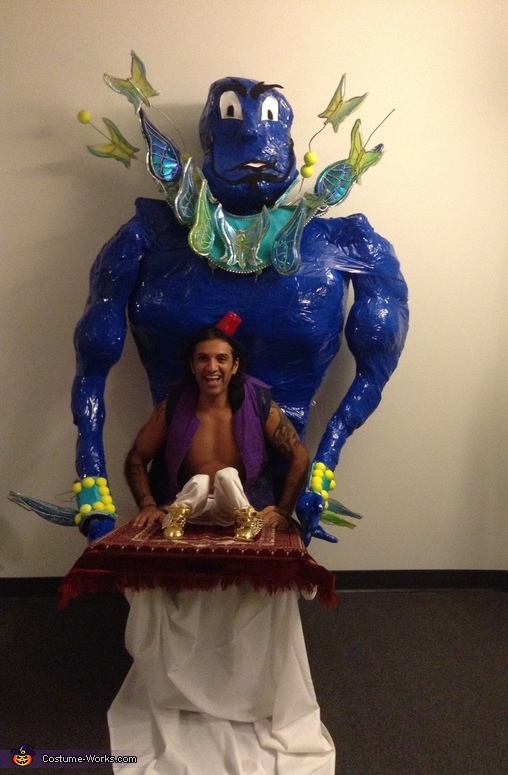 One of my friends said I should be Aladdin for Halloween but I wanted to do more than just pj's & a red hat so I decided to have Aladdin on a flying magic carpet being flanked by a 9 ft tall Geneie. I sat down and designed an optical illusion that would not only look good but be functional. I built most of the costume with discarded styrofoam & paper mech. Everything was then painted and covered with blue cellophane tape to make it glisten. I attached a back pack and waist strap so I could haul it around and made the flying carpet frame with pvc pipe. the costume was too big to get through door ways so it was made in pieces and assembled on location with hot glue and tape.. It was a labor of love and the response was incredible. People's faces lit up when they saw us coming from a mile away!